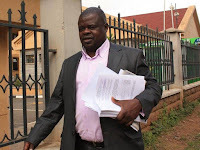 Thursday April 11, 2019-Human Rights activist Okiya Omtatah on Thursday proposed a solution that would see Kenyans end the problems associated with the handshake. Speaking at a local TV station, Omtatah noted that the handshake between President Uhuru Kenyatta and ODM leader Raila Odinga only managed to calm the political temperatures momentarily but did not heal the deep wounds and the ills that bedevil the country. According to Omtatah, the handshake had only postponed a problem, which the country needed to address once and for all. He noted that the only way to ensure that the country had peace was to have free and fair elections, and everything else would fall into place. “We need to get to a point where we hold tamper-proof elections which speak for themselves whereby the winner is the winner and the loser is the loser, therefore, we don't have things like the handshake and Government of National Unity," Omtatah stated.